-лвл 5-10 вы все равно качаетесь на таких локациях что позволяет при выполнениее задания ходить по локации тем самым вы наталкиваетесьна руду . На данный момент руда отлично собирается в локации Серябряный бор. Если собирать только медную руду, то оптимальнее всего использовать подобный маршрут. С маунтом 310% за круг (~7-10 минут) собирается 2.5-4 стака руды. медь оч хорошо качать в Темные берега. 1 круг по Элвинскому Лесу в 8 вечера по серверу. Без заходов в пещеры на флае 280 вышло 90 штук ровно, т.е. 4,5 стака. Так что, хуманы, дерзайте. Эта руда бывает почти всегда на склонах. Самый лучший фарм этой руды - в Темных берегах (Калимдор, стартовая лока НЭ). По всей локе справа протекает речка, просто летаем около нее и собираем руду, которой там вагон и маленькая тележка. + руда валяется не только у речки, но и у моря. Кстати, удобно еще и тем, что после Темных берегов можно сразу в Ясеневый лес за Оловянной рудой. Еще одно место посоветую: Север Дуротара (южнее Оргриммара). Маршрут следующий: Скала черепа (57, 9) - потом вдоль гор через Маргоза (56, 20) добегаем до Пещеры (52, 29) - чистим её и спрыгиваем справа о входа в данную пещеру на Сухую лощину - сразу через тоннель идем налево и потом движемся в сторону Оргриммара к началу маршрута. Две пещеры и путь около гор дадут богато меди. Just a guess as I have not played TBC yet, but from everything I read Jewlcrafters will be able to pull gems from raw ore.
My wife will be starting a new BE Mage w/ Enchanting & Jewlcrafting, and I will be starting a BE Pally w/ Smithing & Minning. Either way we will needs lots of Ore. I have been mining bags and bags of the stuff with some of my higher alts so that we can easily level up our trade skills on launch day. The best horde ore grinding is by far in Durotar, just keep making a large loop around Razor Hill. The best alliance ore grinding is Dun Morugh, there are plenty of places to mine there but they are scattered around the map. Loch modan, circle east of the lake, from silverstream mine to Thelsamar. Alliance copper grinding = Dun Morogh, for sure. Go to the quarry! Do a circle in the quarry itself, then in the trogg cave. If you find a gap in the spawns there, then step out of the quarry and do a little circuit outside. The shore of Darkshore is also quite a good spot for copper nodes. I do all of my copper mining in Elwynn Forest at night. I get three stacks in an hour. I'm sure it isn't the most advantageous, but Elwynn is nice and quiet at night. I've only recently run into "competition," and such is easily resolved when you agree to circle Elwynn from the opposite direction (starting at the entrance to the Valley of the Kings). I started a blood elf rogue after buying the expansion a few days ago, and set him up with mining and jewelcrafting. While running around Eversong Woods doing quests, I've come across over 56 veins, and have accumulated over 8 stacks of Copper Ore. Once or twice I've gone off the road and stood in an area that had two or three veins, and they regenerate fast! Every 5m or so. Great place to farm. If you are near the Barrens and have a mount, (not necessary but helps) there is alot of ore around. I filled up a Netherweave Bag with just a few laps. If have the Burning Crusade expansion installed and are closer to Azuremyst, try looking around there (again, a mount would help). The population there is usually less than alot of other starting zones. I usually get around 40-70 of the ore there just questing, not even looking for it. The only downside with mining in The Barrens is all the Blood Shards you get too. Mulgore gets my vote too. Venture Co. Mine in Mulgore farming ftw. As much as some of the places has tons of nodes it doesn't automatically make it the best area to farm the copper. Only so many of them node are up at a time randomly, not all of them. Barrens is a huge area and would take awhile to run around and farm. Personally for alliance i prefer Elywnn Forest, relatively small area packed full of copper. If you do a circuit from Stormwind along the North hills, dropping inside the cave, around the outer edge of Stone Cairne Lake, quick visit to the middle of Stone cairne lake, then just run along the south side of the road and heading back west all the way to the river at the West before hogger, (not forgettin to go inside the mine on the way, before running north and heading back towards stormwind across crystal lake you should farm loads. Average about 60-90 depending on amount you get lucky with and other farmers in about 10 minutes on a level 70. Probably 20-30 minutes for people with a similar level to the area as killing stuff in the mines may take some time. Krazycarn's Guide To Azeroth's Mines,Ores,And Metals. Copper is rather soft until smelted,although still is weak. Commonly used for new engineers,jewelcrafters,and blacksmiths. Because of its,softness it is useful for lining sword hilts and such. To all hordies! I say: Eversong woods is the place to farm copper on, the east side is not as good as the middle- to west-side. I do a lot of mining and have found zig-zagging south from Goldshire until you get to the mountains just past Dead Acre and then heading west along the Dagger Hills until you get all the way to Longshore, then going north will net about five stacks of copper ore and one stack of tin. It takes about 45-minutes but stopping in goldshire and selling off all the stones you picked up gives everything time to respawn. I tend to run this circuit about once a day to keep my Lock in "purty" clothes. Also, running a little later at night means you don't get much competition for the deposits. Your actual milage may vary. I have tried to download gathere but it seems to not work so if u can help me ill extremely appreciate it! i know u get tigerseye,.... but how u do? Ran one circle around the outer edge of Mulgore and got 94 copper ores, 72 rough stones, and 1 malachite. Basically the game doesn't put ore in areas that your skill shouldn't be at while your working in that area. So yes by the time you hit your level 10-20 area you should be able to smelt Tin, and maybe even mine silver when you find it. Same thing goes for Herbs. Your easiest to harvest herbs will be in the level 1-10 areas, then the next hardest herbs will be in the 10-20 level areas and so on. Oh and it's wonderfully frustrating for those of us on PVP servers to put all the more common ore such as Iron in contested areas. That way when we find it we can be killed by the opposing faction who is farming it to make money at level 80, as opposed to us who are level 25 trying to level our black smithing/mining skills. @ crsunlimited: Why QQ? You must have expected this to happen, it's your decision to roll on a PVP server. The best zone if you got a mount and want to farm this stuff for alts (like I'm doing) is definetly Mulgore! Just keep circling around and popping into the goblin cave. Install these addons and you are good to go. 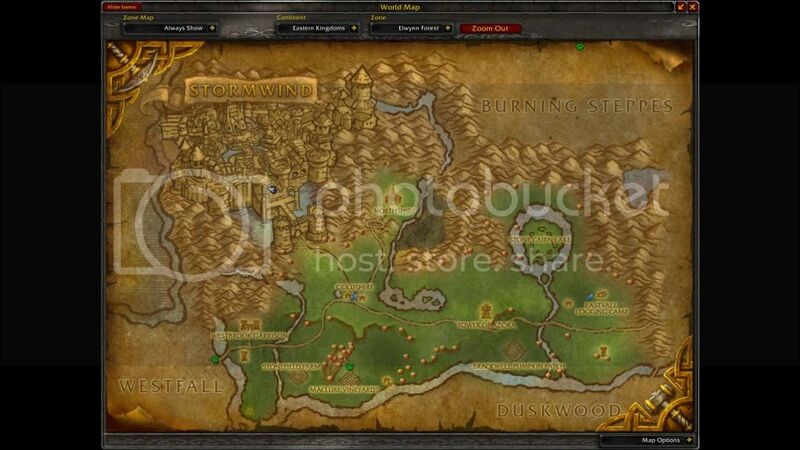 You can easily see where you have to farm wherever you are in wow. Best place to farm is westfall. Then you can go back again. With the Shattering Darkshore now has an incredible amount of copper veins. If you have a flying mount and go through the zone you are very unlucky if you fly for long without finding veins. I flew around and mined and got five stacks of copper ore in, what, 20 minutes? This is the best place to farm Copper Ore, in my opinion (especially when there’s no competition about). It’s not ground-mount friendly due to all the fissures in the land, but even if you’re a low level, there’s Copper Ore to be had everywhere you go. This is one of the more simple routes when it comes to mining Copper Ore in a zone. It's not so much that you even need a route to look at, you simply have to follow along the mountain-side. But, just in case...here you go. The cave east of Orgrimmar (Skull Rock?) is really fantastic. I've gotten about a stack of copper ore for each visit. Procuretheas, The Terrible Indominator: Ooh, copper ore? My Fav. places to mine copper are: Loch Modan just go around the mountain range in a circle flight path then the lake area. Darkshore, were ever the land masses are broken you'll find copper and a lot of it. It helps a lot if you have a flying mount, unfortunately if you don't your going to be doing a lot of jumping. Ashenvale is a also a good spot as there is plenty if tin there too so if you want to make bronze bars with out going to another area then this is the place to go. copper ore is found just about everywhere. its hard not to find it! Just start from Orgrimmar and do a lap around the map counterclockwise. I do it in 20 minutes with a 60% mount and get about 110 ores a run. Very fast respawn rate so you can do many runs in a row. Remember to go into the cave north of Razor Hill just before the harpy canyon. Also drop into the harpy canyon for extra ores. Very nice just do laps around the northern area for most ores... The southern area has less veins and has higher lvl mobs so it is not recommended for lower level chars. Got about 75 in one run. Again there is a quick spawn rate. Basically just following the outskirts of the zone, maybe dropping in to check on the ridge and the lake/river area. The gold per hour is calculated at the current average copper ore price on my server (1,3 gold / copper ore). I've found the best place to farm these as you level (as Horde at least - possible for Alliance too) is northeast Durotar. The caves at Skull Rock (straight east from Orgrimmar entrance) and just northeast of Razor Hill are both filled with copper and, if you are lower level, you should be able to simply run between those two points and they will respawn in between. If you have a flying mount, Darkshore had tons of copper veins. Highly recommended.